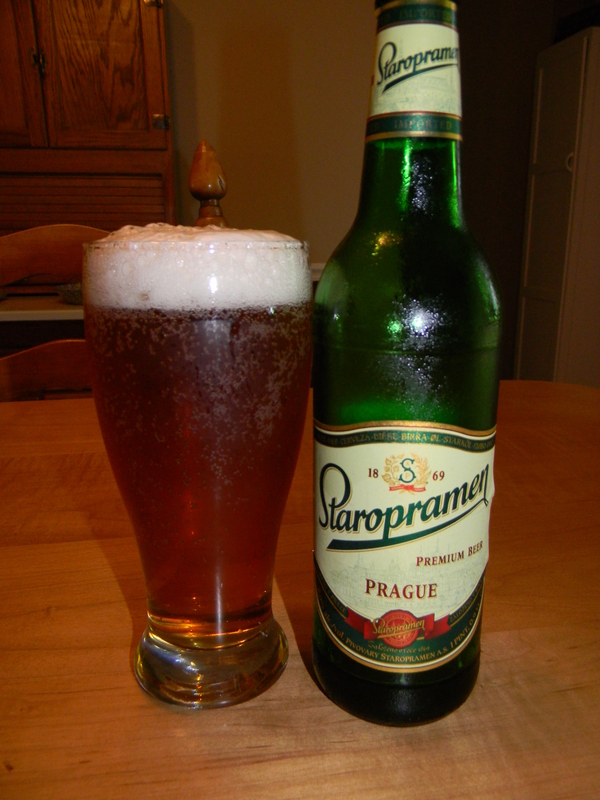 Review of Staropramen Premium | Beer Apprentice - Craft Beer News, Reviews, Interviews and Info. ← If you could travel to any country in the world and do a full blown “beer tour”, which country would you like to visit? Hello everyone. How’s it going? Sorry that it’s been a few days since my last post, but I’m ready to get back to it. For today’s craft beer review I’m going to be trying the Staropramen Premium produced by Pivovary Staropramen made in Prague, Czech Republic. You know, I’ve been writing these reviews for about 2 1/2 years and I have yet to review a beer from the Czech Republic!!! Well, that’s about to change I guess. I checked on the website, www.staropramen.cz, and found this little description. Ok. Let’s give it a try. Shall we? This beer came in a 16.9 oz. bottle and it had an ABV of 5.0%. It poured a clear, deep golden to almost copper color. Some brighter yellow highlights were shown around the bottom of the glass. The crown was barely off white, soft and small, but dense and quite creamy. The retention time was choice and it produced some nice lacing to boot. A very attractive beer I thought. The aroma was dead on Pilsner. Bready, cracker type malts with a slight toasted grain note. Some grassiness and a bit of hay with a very soft, floral hop bouquet. The balance was nice too. It wasn’t anything over the top, but it was far from sterile. The taste was, again, Pilsner to the bone. Subtle breadiness intermingled with an unsalted wafer savor. The grassiness seemed to step it up a tad, while a touch of bitterness from the hops added a bit of complexity to this otherwise straightforward profile. The mouthfeel was medium bodied. Smooth, but crisp. Quite refreshing and thirst quenching. A semi-dry, snappy finish with a good medium strength carbonation. The flavor vanished a little quicker from the palate than I would have liked, however a little dollop was left behind. Overall, I found this to be a very nice little beer. I really enjoyed it. I would have no problem sharing this beer with friends. Especially ones that may be just getting into craft beer. This one could be an easy stepping stone for someone looking to branch out. It’s solid all around with enough character to create some conversation. It would be perfect for Spring and Summer also because of the refreshing qualities and the ease of drinkability. Have you guys ever had the Staropramen Premium? What did you think? Did you enjoy it? Leave a comment and tell me of your opinion if you’d like. Can’t believe you waited this long to blog about Czech beer! They brew some of my favorite beers on the planet! Now that you’ve written your inaugural Czech beer post, I hope to see more in the future! I know. I couldn’t believe it either. I’ll definitely have to post a few more. Thanks for reading and commenting also.